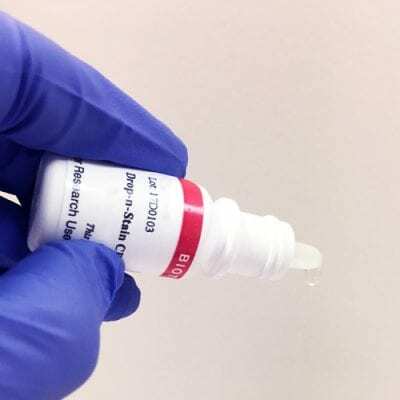 Drop-n-Stain™ CF® dye goat anti-rabbit IgG (H+L) is provided in a convenient dropper bottle for easy dispensing without pipetting. To minimize cross-reactivity, the antibody has been adsorbed against human, mouse, and rat serum. Drop-n-Stain™ CF® dye goat anti-rabbit IgG (H+L) is provided in a convenient dropper bottle for easy dispensing without pipetting. To minimize cross-reactivity, the antibody has been adsorbed against human, mouse, and rat serum. CF® dyes are superior alternatives to traditional fluorescent dyes owing to their exceptional brightness and photostability. CF®488A (Abs/Em 490/515 nm) is a superior alternative to the traditional green fluorescent dye FITC (or fluorescein) owing to its exceptional brightness and photostability. CF®488A has brightness and photostability comparable to Alexa Fluor® 488. CF®543 (Abs/Em 541/560 nm) is an orange fluorescent dye with an excitation spectrum optimally matching the 543 laser line. Antibody conjugates of the dye are much brighter than those of Alexa Fluor® 546. CF®594 (Abs/Em 593/614 nm) is spectrally similar to Alexa Fluor® 594 and Texas Red® dye but yields much brighter protein conjugates due to its high quantum yield and exceptional water solubility. CF®594 also has excellent photostability ideal for demanding applications, such as confocal microscopy and single molecule imaging. CF®640R (Abs/Em 642/662 nm) is a novel rhodamine-based dye spectrally similar to Cy®5 and Alexa Fluor® 647. CF®640R is as bright or brighter than spectrally similar dyes, but it has the advantage of being exceptionally photostable. Download a list of CF® dye references.